The pool & hot tub will be closed for Summer 2018 & open again Winter 2018. Columbine 201 is a comfortable condo with a superior location in Breckenridge. Five minute walk from the Peak 9 Super Six Chairlift and less than 500 feet from the Maggie Pond skating rink, you can park your car in the reserved, indoor parking space and walk to your skiing and skating. Downtown restaurants, shops, and Hyatt's Main Street Station are only a block away. You can walk 500 feet to the bridge that crosses the Blue River and onto numerous hiking and biking trails up, over, and along the peaks of the Ten Mile Range. You can also mountain bike or ride a 'comfort' bike on the 9 mile paved path alongside the Blue River (get a 20% LaZal Resort (Summit) Vacations guest discount on bike rentals). Enjoy the Columbine heated outdoor pool and hot tub complex. Walk 2 blocks to downtown Breckenridge's many restaurants and shops. Enjoy the 4th of July parade, river rafting on the mellow Blue River, the Breckenridge Pro Rodeo (7/22-8/31/13), the National Repertory Orchestra concerts (late June to mid August), and the 2013 Pro Challenge Bike Race (with a stop and start in Breckenridge (8/20 & 21). You can also enjoy Breckenridge's Fun Park on Peak 8, featuring an alpine slide, two person roller coaster, miniature golf, climbing wall, fun maze and pony rides for kids. Horse and pony rides up the mountain are also available at the Breckenridge Stables on Peak 9. Walk 700 feet to the Quick Silver Chairlift. Walk 2 blocks to downtown Breckenridge's many restaurants and shops. The free bus system in Breckenridge will take you to other Breckenridge ski lifts and the Nordic Center for cross country skiing. The Breckenridge Recreation Center (user fee charged) on the bus route features an indoor pool, free weights, weight machines, aerobic classes, two climbing walls, and an indoor track. A county wide free bus system will take you to Frisco (and its Nordic Center) and to the Keystone and Copper Mountain Ski Resort Areas. So, avoid the hassle of traffic, snowy streets, and hard to find parking spaces. Become a pedestrian and enjoy your stay. The condo is a large (about 1200 square feet), newly redecorated, two bedroom, two bath Condo. The master suite contains a queen-size bed, large vanity and sink, and separate bath/shower/toilet. The guest bedroom contains two twin beds and is located directly across the hall from the second full bath. Ample closet space is available in both rooms. Clothes washer and dryer are available on site. The living area contains a queen-size sleeper sofa and flat screen HDTV, VCR/DVD video, and AM/FM/CD radio. Password protected Free Wifi and local phone service are provided. The fireplace is gas fired, easy to operate, and smokeless. A small balcony exits off the living area. The walk through kitchen contains new appliances including smooth top range, refrigerator, and dishwasher. Coffee maker, blender, toaster, crock pot, cooking utensils, table service, and a variety of beverage containers and wine glasses are amply provided, as are all linens. Don't think of this condo for only winter activities. Breckenridge has an exciting year round schedule which includes a film festival and summer long music festivals (the music tent is an easy stroll downstream). Hiking is available on the adjacent White River National Forest and the Gore-Eagles Nest Wilderness Area is nearby. A bike path runs from Breckenridge to Frisco and, we are told, all the way to Vail. Lots of mountain bike trails are available on the White River NF. And, of course, rental bikes are available in town. Other activities such as golf, horseback riding, river rafting, hot air ballooning, 4X4 tours, hay rides, and more are advertised. See the Breckenridge Website link below and other websites for more information. Uber & Lyft in the area! Skip the long lines and walk to Quicksilver six chair. Very convenient location. The property was fine, a bit old and run down but the location was great. So it worked. We had to retrieve the key from a combo lock attached to the door, which was fine, except for the fact that we also needed a key to get into the garage for our car. The property manager told us we should leave the key in the combo lock attached to the door at all times, the problem with that was we needed that key to get in and out of the garage! He said he didn't know that, so he told us to come by the property office to see if they happened to have a spare key for us to use for the garage. We left the property to drive over to the office to get this 2nd key of sorts, and the property manager gave us a potential key with the words "not sure if it works, but give it a shot." Luckily it did. It's been 2 wks since we've returned from our trip and the owners have yet to return my very large deposit. If I had not have called VRBO to request that it be returned, I don't think it would have. This property is poorly managed. Not the best experience at all and would think twice about booking with them again. We LOVED our stay at Columbine 201! The unit is clean, roomy, comfortable and located very close to the slopes (walk to the lift) and all the downtown action. The condo comes very equipped with lots of cooking ware, dishes, blankets, spices and paper products -- everything you may need. Fireplace was awesome and easy to light and I loved the indoor parking with the colder temperatures. We never did make it to the hot tub or pool - but so nice to have as an option. It even has an outdoor balcony. Summit Properties was wonderful to work with too -- they held my Christmas deliveries even staying open late to wait for me to get off the slopes to collect. I highly recommend! The place was nice and within a 5-10 min walk to base of Peak 9 and Main Street. We did have to call for more soap as they gave us 2 very small bars (one for each bathroom) which didn't last long and the handsoap at the sink was out. We were told we were expected to bring our own and they only provided "starters" but actually were kind enough to send a few extras over. We didn't use the pool/hot tub more than once. There were no chairs to sit on at the pool and most of the hot tubs were inside, so the outdoor mountain ambiance was not there. Overall, nice clean place and great location. 1.Although, basically four minute walk off Main Street, it is a quiet area. We have stayed in other downtown properties and this one did not have the noises of revelers, plow trucks, buses etc. 2.Condo was clean. Good parking. 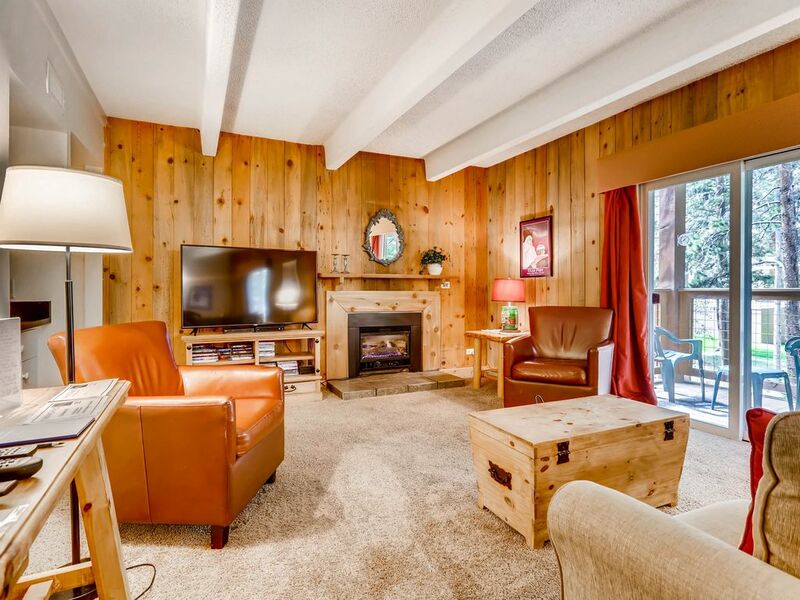 Nice fireplace and updated comfortable furniture. 3.Very reasonably priced and has a nice inside ski and snowboard storage area. The entry is warm and all gear is nice and dry when the day begins. 5. Good value for the price. 6. We really liked the small gas fireplace which kicked out good heat. At night we put wet gloves and mitts in front of it and they dried quickly. 1. A little dated. A funky bi-fold door to kitchen. Not sure what purpose it serves. 2. Mostly old teflon cookware. 4. The pillows were all the same. They were fine as far as quality goes, but all firm and bulky. 5. Appliances were fine. Older but worked ok.
6. The hot tub and pool area is a bit of a walk uphill outside. Seemed nice enough but not conveniently located for this condo. 7. The laundry is in the parking area in the basement. Old machines that take quarters. We didn't use them. It is dingy and seemed a hassle for us. 1. So even though the neighborhood is quiet, the garage door to the underground garage is beneath this condo unit. And even though it is on the second floor, the garage door opening and closing was frequent and very noisy. 2. Minor improvements could make this condo very nice. If you like to go out at night or during the day, this is really an ideal location.We walked onto Main Street every day. The walk to the lifts is a breeze. Breck ski shop, Christy's and Charter Sports are all right there on the walk to the lift. Very convenient. 3. For the location and price I would rent it again. We had six people in the unit and we were all comfortable. The space was perfect; clean, kept up. Location is great for walking to wherever you need to go. Good parking available on site. Thank you for your positive comments. We strive to provide a wonderful guest experience and are encouraged by your comments that we are on the right track. (Pool is closed for renovation all summer) Columbine 201 is a comfortable condo with a superior location in Breckenridge. Five minute walk from the Peak 9 Super Six Chairlift and less than 500 feet from the Maggie Pond skating rink, you can park your car in the reserved, indoor parking space and walk to your skiing and skating. Downtown restaurants, shops, and Hyatt's Main Street Station are only a block away. A heated pool and indoor/outdoor hot tubs are available onsite. Make sure to check your spam folder after sending an inquiry. Walk 700 feet to the Quick Silver Chairlift. At the end of the your ski day, you can relax in the Columbine heated outdoor pool or hot tubs. Walk 2 blocks to downtown Breckenridge's many restaurants and shops. The living area contains a queen-size sleeper sofa and flat screen HDTV, VCR/DVD video, and AM/FM/CD radio. Password protected wireless internet and local phone service are provided. The fireplace is gas fired, easy to operate, and smokeless. A small balcony exits off the living area.